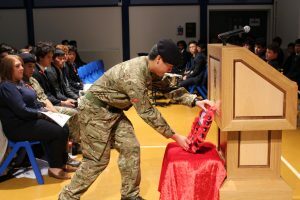 Service and sacrifice informed the special remembrance assembly held at the School to mark the centenary of the Armistice in 1918. All boys from Years 7–10, together with staff and many senior pupils, took part in the ceremony, which featured music, poetry and a procession by the Combined Cadet Force. In an address to the assembly, Old Elizabethan and Governor Ken Cooper (1942-50), a former officer in the Royal Warwickshire Regiment, charted the course of the war, making clear the scale of the conflict and its great cost. He explained how the emergence of trench warfare on the Western Front led to combat that lasted for months and years yet resulted in minimal or no t erritorial gains for either side. The Headmaster read aloud the names of the 48 Old Elizabethans killed during World War I, whilst the names of the 65 who died in World War II were projected on to a screen. The two-minute silence at 11 o’clock was heralded by six of QE’s senior trumpeters sounding the Last Post. 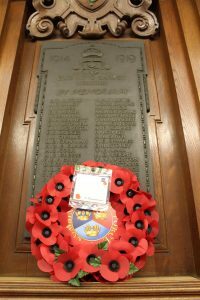 At the end of the assembly, the CCF contingent marched with the commemorative wreath to the War Memorial located in the Crush Hall, where it was placed. Separately, Year 12 historians had a special tour of the Imperial War Museum’s World War I centenary exhibition, courtesy of alumnus Dr Ian Kikuchi. Ian (OE 1997-2004) curated the exhibition and answered questions both about the war and about the logistics of curating major exhibitions. Alumni continue to support QE by giving careers talks. 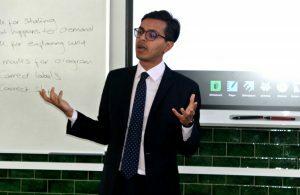 This term’s included a lunchtime lecture by Samir Manek (OE 2001–2008), a litigator working at the heart of the UK’s financial regulatory system as an Associate (Solicitor) with the Financial Conduct Authority. 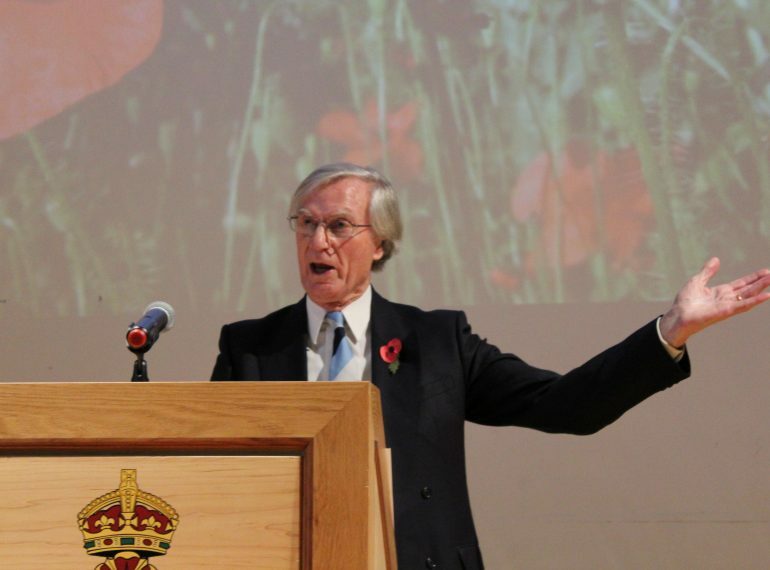 He urged on QE’s aspiring lawyers the importance of a genuine passion for the Law. Two younger lawyers, Suraj Sangani (OE 2005-2012) and Izzet Hassan (also 2005-2012), gave boys in Years 11-13 insights into how to pursue a career in Law, with both stressing the importance of preparation and persistence. Izzet, who is a Future Trainee Solicitor at London-based multinational firm, Slaughter and May, graduated with an LLB in Law from the University of Warwick before completing an MPhil in Criminology at Cambridge. Suraj followed an alternative route, reading History at Warwick before being recruited by Hogan Lovells, which has joint headquarters in London and Washington, where he is a Trainee Solicitor. 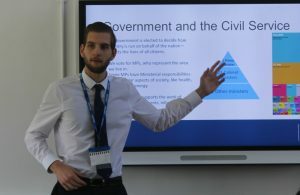 And Civil Service economist Andrei Sandu (OE 2007-2014) told senior boys that he was already advising a Government Minister at a European summit, just a few short months after starting his job. Andrei joined the Department for Business, Energy and Industrial Strategy (BEIS) as part of the economists’ group of the Civil Service Fast Stream in August last year. In the autumn of 2017, he was called upon to attend a Council of Ministers summit in Brussels, where he advised Lord Henley, of BEIS, throughout the session. Piers Martin was part of a relay team that successfully swam the English Channel in rough conditions and raised more than £6,000 for Autism East Midlands. Yet, even though the team were eminently suited to the challenge – Piers (OE 1987–1994) is a high-performance sport and business consultant and a former national-level swimming champion, while two of his fellow team-members are water polo coaches – the swim almost didn’t happen. 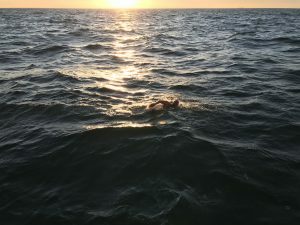 Because of worsening weather, the authorising organisation, the Channel Swimming and Piloting Association (CSPA) had called off the swim, only to give the team an eleventh-hour reprieve after they had already left Dover and were heading home. 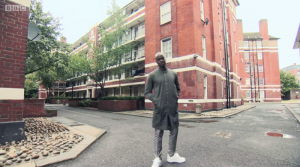 George the Poet (George Mpanga, OE 2002–2009) has raised his already-high profile still further by appearing on TV screens in both the public and private spheres. A keen advocate of social justice, George investigated how and why the capital’s poor residents are losing out as council homes disappear for an Inside Out London current affairs programme on BBC1. He also starred in a new commercial for O2 reflecting on the wonder of Planet Earth and the transitory nature of human life. 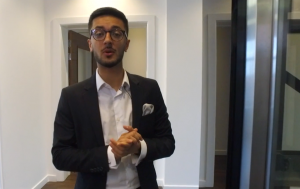 Akshay Ruparelia’s fast-expanding online estate agency, Doorsteps.co.uk, launched a second crowdfunding round during the autumn – and smashed its £400,000 target within seconds of the offer going live. Akshay (OE 2009–2016) made national headlines last year after the first fundraising, with the young entrepreneur’s age attracting journalists’ admiration. Fronting the latest fundraising drive, he explained that the money raised, which eventually came to nearly £900,000, will pay for more staff and additional investment in technology as the company grows. Performance coach Kam Taj (Kamran Tajbaksh, OE 2004–2011) has published a new book offering students his own innovative and detailed holistic approach to achieving success as a student. Entitled The Ultimate Guide to Exam Success, the book is the latest in a series published through UniAdmissions, an education consultancy which helps students applying to Oxbridge and medical schools. The first four chapters of the 182-page paperback are on: time-management, study tools & techniques; mind-management and on-the-day performance. “Unlike any other book on exams, the final four chapters are on optimising our lifestyle so we can stay physically and mentally healthy throughout our studies,” Kam adds.